It’s the same thing every summer. 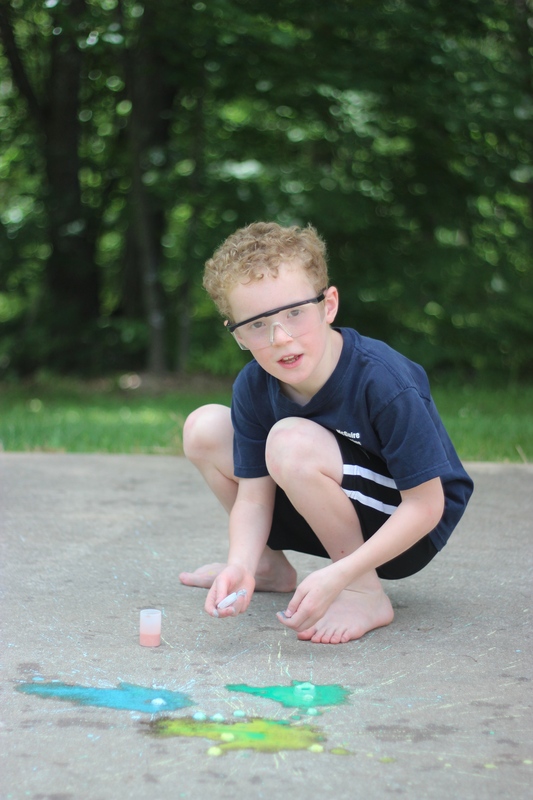 “Mom, can we do a science experiment today?” But “today” is everyday in the McGuire house. These boys can NEVER get enough. This summer though, I thought I’d better have a plan. 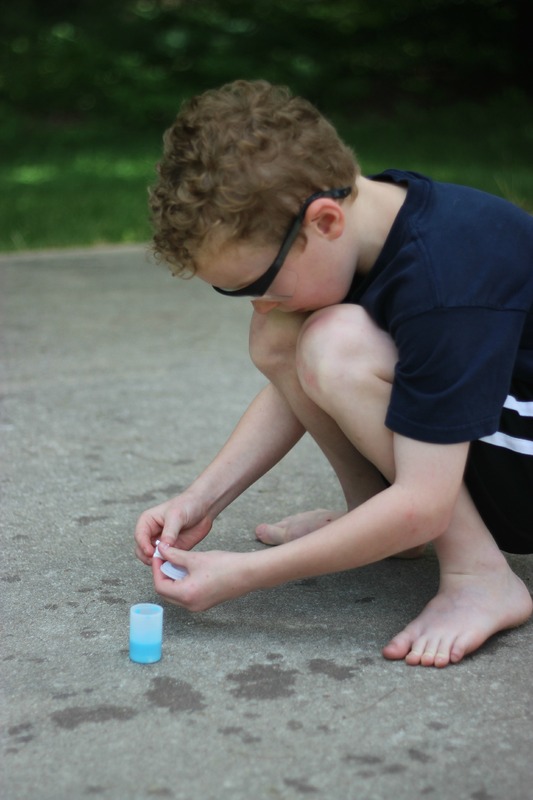 So together, the boys and I have designated one day a week for science experiments. They have already picked out some oldies they want to revisit from past summers, but we are also venturing into some new territory. The best part of all this is that they actually help me find fun, hands-on projects to do with my kinders. Some are kinder keepers and others are ones we just ‘keep’ for home. But all of them are guaranteed fun. 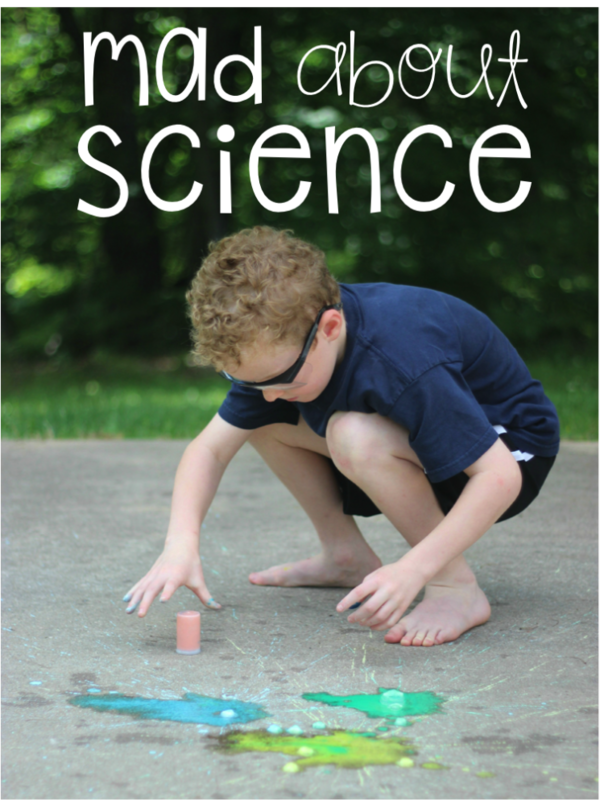 Half the fun of doing these experiments is searching for the good ones from books at the library and on the internet. This one that we found from Growing A Jeweled Rose. It has two very key words in it which makes my boys say, “Yes, please!” EXPLODING and ROCKETS. 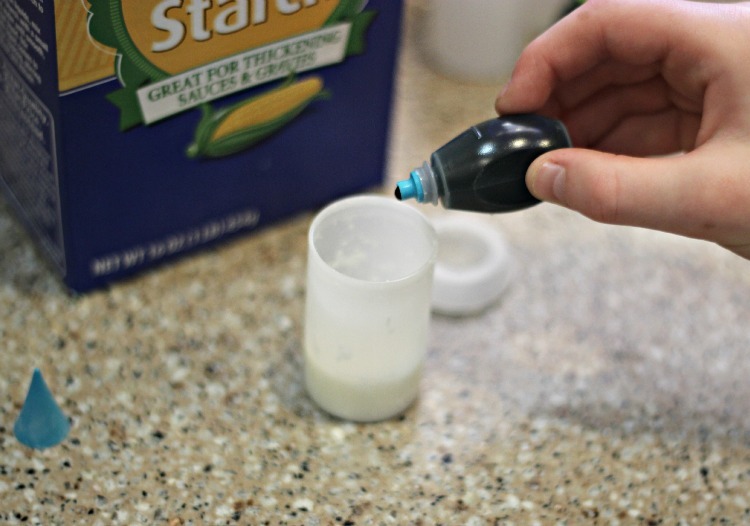 You can either mix up the chalk concoction before hand in a larger container or go ahead and mix it up right in the little canisters like we did. It’s a pretty simple process. 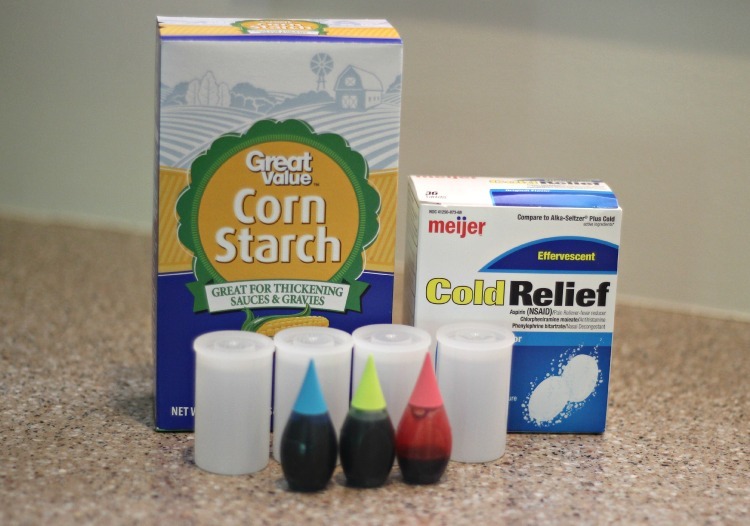 You need to fill the canister about 1/4 way full of corn starch and add about the same or a little more of water and mix. Then add your food coloring or paint. I waited until the boys got outside before we did that. 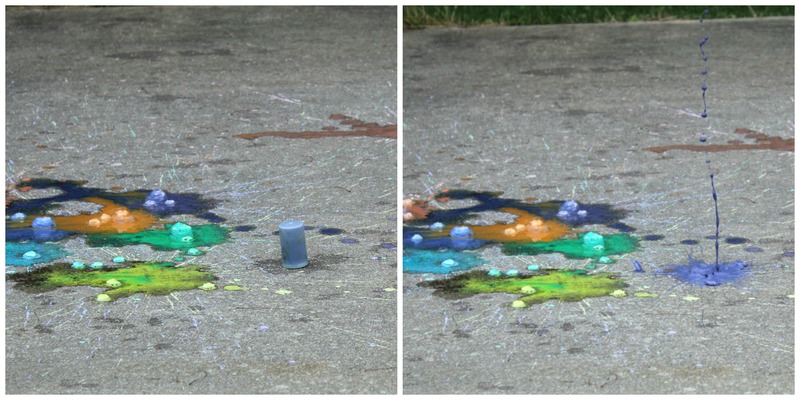 Food coloring and little boys don’t mix. It’s better just to take the mess with a grain of salt and plan on them having stained hands if it spills a little. Once you have your canisters set up and coloring mixed in, it goes pretty fast and easy. But remember, you HAVE to wear your safety goggles. These things really take off, and you don’t want anyone getting popped in the eye. 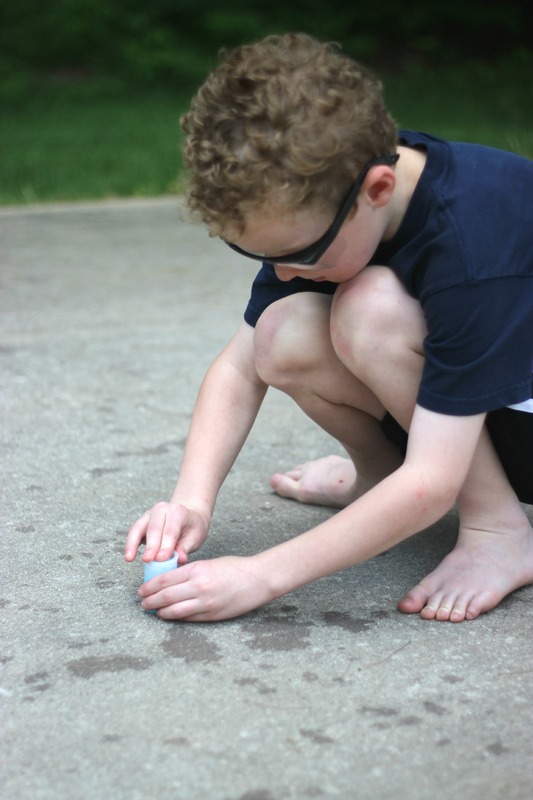 Now that your safety goggles are in place, it’s time to get started. Break the alka-seltzer into 3 or 4 pieces. Place them into the canister. Quickly place the top on it and flip it over so the lid is on the ground and stand back. Watch this! It’s fun! It’s so fun. One minute nothing and the next POW!!!! That thing flies! So, of course, when the alka-seltzer hits the liquid in the container, it starts to dissolve and release gas. Carbon Dioxide! As that gas is released, it has no place to go. It creates pressure. When it gets to the point that there is no more room for the gas, the lid is released. Since the lid is facing down, the canister goes up. And man, does it ever go up! It makes you kind of wonder about what actually happens when you ingest this stuff doesn’t it? Now my boys, of course, are all in planning mode for the next time we do this experiment. (I anticipate that will be tomorrow since I still have plenty of Alka-Seltzer left.) They were wondering what happens if they would add more water. What happens if they didn’t break the Alka-Seltser up. What if we taped a parachute to the canister? What would happen if we launched two canisters at one time right next to each other? And on and on . . . but isn’t that what it’s all about? Experimenting, making changes and wondering ‘what if’ and trying it again . . .
Could this be used with my kindergarten kiddos? You betcha. In fact, have your students build a rocket to go around it and put some paper down under the launch pad and you could even probably squeek this by as a STEAM project. It’s differentiating to meet the respond to your scientific and artistically inclined students. And the best part is, it’s already kid tested! So, I know they’ll love it. 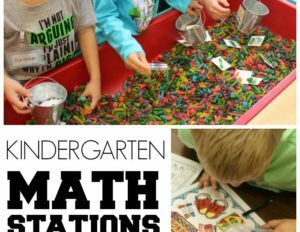 Follow Marsha McGuire (Differentiated Kindergarten)’s board Fun With My Kids on Pinterest.